Vegan Strawberry Oatmeal Breakfast Bowls Recipe from Oh My Veggies! Growing up in a busy family with two brothers and a sister, weekday breakfasts were always about the quick and easy. Cereal or oatmeal was the go-to, and Strawberries n’ Cream instant oatmeal packets were my favorite. While I still enjoy creamy strawberry oatmeal, I now take a more nutritious approach that includes a balance of protein, natural sugars, and healthy fats. These vegan Strawberry Oatmeal Breakfast Bowls are just as quick and tasty — but worlds healthier. “Just add water” certainly has its place in the life of a bustling family, and that’s exactly where this recipe can come into play. It really is as simple as just adding milk (coconut and almond milk, that is), but instead of an empty carb breakfast that leaves you hungry at 10 a.m., you get a well-rounded meal that guarantees hours of satisfaction. All it takes is a combination of fresh fruit, rolled oats, nuts, and seeds to start your day off on the right foot. This complete meal includes fresh strawberries, chia seeds, pumpkin seeds, slivered almonds, coconut milk, and almond milk. A little pure maple syrup is all you need for some natural sweetness. If you like to change up your breakfast now and then, you can modify the recipe to your taste by adding a dollop of nut butter, yogurt, and/or a mix of your favorite fruit and nuts. Another major plus: You can make this breakfast either hot or cold! Because the weather is getting warmer, I have been making the overnight version — one that’s eaten cold — instead of cooking the oats on the stove top. If you’ve never made overnight oats, it’s easy! You simply soak the rolled oats in your choice of milk, along with sweetener and any other add-ins you like, such as vanilla or cinnamon, and plop it in the refrigerator overnight. That’s all it takes for your breakfast to be ready for you in the morning. Just add milk? Don’t mind if I do! This post was originally published on May 29, 2014. 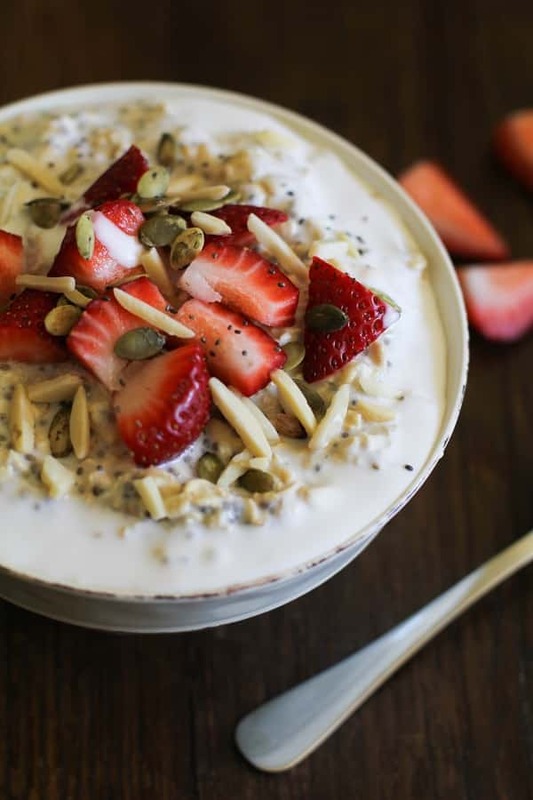 Packed with hearty oats, juicy strawberries, and heart-healthy nuts and seeds, these wholesome breakfast bowls are as irresistible as they are satisfying. We’ve included directions for both cold (overnight) and hot versions so that you can enjoy them all year long. Add all oatmeal ingredients to a large container with an airtight lid and stir well. Seal and place in the refrigerator overnight (or at least 6 hours). 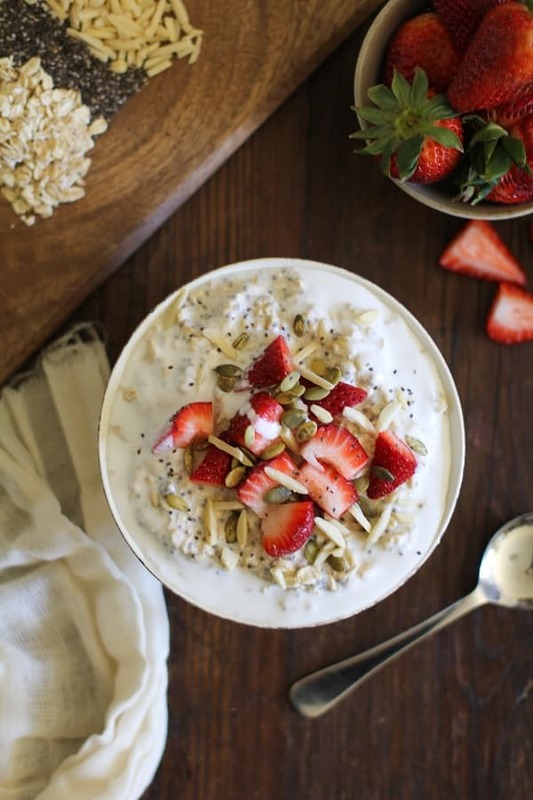 Divide the oats between four bowls and pile each with strawberries, pepitas, and almonds. Add additional almond milk or coconut milk if desired. Add the oats, chia seeds, coconut, maple syrup, coconut milk, and almond milk to a medium-sized pot. Bring to a full boil over medium-high heat, then reduce heat and simmer for 15 to 20 minutes, stirring occasionally, until oatmeal has thickened and the liquid has been absorbed. Remove from heat and stir in vanilla extract. Divide between four bowls and top with strawberries, almonds, and nuts, along with additional almond and/or coconut milk, if desired. Prep and cook times are for the hot version of the recipe. Allow for at least 6 hours for the cold (overnight) variation. Perfect! I’ve been going through punnets and punnets of smoothies lately and I’m not sick of them yet! Oh yes, these breakfast bowls are definitely a nice change-up from the regular breakfast routine. Plus you can add all sorts of variety in them. My next go-round will be with goji berries and walnuts – yum! I’m going to show this to the Mr. This looks right up his alley! It looks awesome! Actually, I am starating to wake up a little bit earlier to have enough time to eat a healhy and full breakfast. This can be a good option! This is my kinda breakfast! I love a big bowl of oats in the morning, and am always looking for ways to dress them up. This looks fantastic! Thanks so much for sharing! I’ll bet I can get my kids to eat “boring oatmeal” if I add these flavors to it! Score! I was just on Facebook and this lovely recipe caught my eye. I just had to check it out! Pinning! Glad you like it! Thanks for sharing, Melissa! 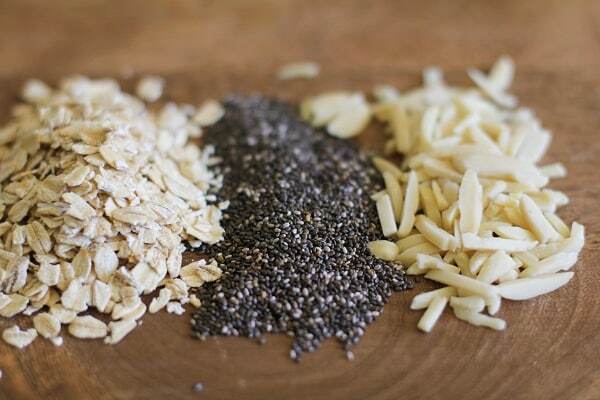 I love adding all sorts of goodies to my oats…love this! Gotta love them goodies! They’re what make a bowl of oats fun and interesting. Thanks, Liz! I have strawberries and almonds at home. Sounds like a great idea! Plus someone said overnight oats is even better than stove-top. Am I wrong? I think it just depends on whether you want to eat the oats cold or hot. I personally feel like there’s a place in life for both versions and it’s always a matter of what I’m in the mood for. The benefit of overnight oats is they take seconds to make versus having to monitor the stove for 15 minutes 🙂 Glad you like the idea! Cold Oatmeal is a big deal at my house. My husband leaves really early for work each day, so I pack him breakfast as well as lunch. His favorite is soaked oatmeal. The variety is endless, and it is so nice and refreshing in the summer, although he is just as happy to eat it in the winter. Thank you for this fun version–I haven’t put chia seeds or pepitas in it before, so this will be something new and fun! Thanks, Staci! I’m so happy to hear your household is on Team Overnight Oats! Honestly, I’m pretty new to them, but ever since my first batch, I’ve been hooked. Hope you and your husband enjoy the recipe! Thank ya! Let us know if you try the breakfast bowls! Looks delish. Looking forward to trying this recipe. Awesome, thanks Olivia! Let us know when you give them a go! In this scorching summer heat, staying in the kitchen for more than 5 minutes makes me very very restless and cranky! This breakfast idea is just the perfect solution and oh so healthy! I love the overnight method! I haven’t tried it yet but I’m getting too tempted after this post! I’ve been on an overnight oats kick bordering on obsessive lately! I love the idea of using coconut and maple syrup, I’ll have to pick up some coconut milk and give this version a try asap. Thanks for the recipe! This looks amazing! I bet the coconut milk gives it amazing flavour! Thanks, Mille! The coconut milk definitely does wonders for flavor and texture. Plus, I always feel like I add less maple syrup/honey when I add coconut milk because it’s so naturally sweet and creamy. Hope you enjoy! Beautiful bowls, breakfast should always look this good! I love the cold version! Finally, a oatmeal I can eat during the heat of the summer! Yup, gone are the days of sweating bullets while eating breakfast 😉 Glad you like! Yum!!! What a cool idea – overnight oats! One question- can I use steel cut oats??thanks! Hi Alex! Thrilled to know you’re excited about the overnight oats. You can certainly soak steel cut oats overnight, but I don’t think they will become soft enough to eat – you’d likely have to cook them for 10 minutes or so. Maybe it’s worth a shot, though? Let us know if you try! I had overnight oats for breakfast this morning- and just add milk really is the way forward! How do you think the overnight version would go in the microwave the next morning? It’s getting cold in Aus and this recipe looks and sounds amazing, but I eat my breakfast at work! Looks delicious! I will make this Sunday night for quick and easy breakfast before work. Unfortunately I’m the only one that likes oatmeal in my house (their loss:)). Can I make this batch and eat it throughout the week? Or does it need to be eaten in one day? Can this be soaked overnight and the heated up for a warm breakfast in the morning?